Walking the golf course is one of the best experiences in the game. While there is nothing wrong with riding in a power cart from time to time, or all the time if your physical condition demands that you do so, there is just something special about being able to walk the course. The game goes by at a nice pace when you walk along, and there is plenty of time to think about your next shot (or anything else that happens to be one your mind) as you make your way up to the ball. If you don’t already have a push cart, we put together this buying guide of the best golf push carts on the market. Of course, while walking can be a fun experience, carrying your bag probably is not. 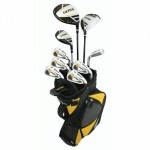 Golf bags can get rather heavy when they are loaded down with clubs, balls, clothes, snacks, drinks, and more. In addition to the weight of carrying the bag down the fairway, you also have to pick it up and put it down between each shot. To lessen this burden while still enjoying a nice walk, a push cart is a great choice. Modern push carts have come a long way from the early models. Most of the options on the market today have three wheels which are designed for all-terrain use, they have a parking break, a drink holder, an umbrella holder, and more. 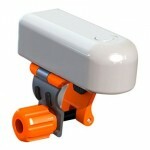 Additionally, some are even designed to fold up tightly for easy transport between your home and the course. If you like to walk the golf course but would appreciate the opportunity to save your back, a push cart is a wise investment. The carts we suggest below range from $140 to $220. For most golfers this is a significant investment. You can find a decent Caddy Tek push cart on Amazon for as cheap as $80. A cart like this will service you just fine, but we’ve selected a few more expensive options because of their durability, storage size and features. 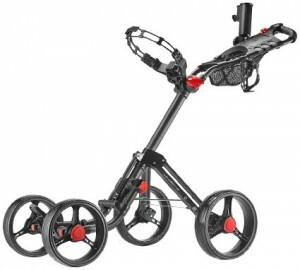 That means even if you buy the top of the line push cart we recommend below (Clicgear 3.5+) for $220 it will only take ~11 rounds before you recoup you money. If you’re serious about golf, 11 rounds is nothing. That means if you use your personal push cart once per month you will make your money back in less than a year. If you’re paying 25 to 50% of the amount for golf, how more likely are you to play? The less you pay the more you can play. For most golfers, the more you play the better you will get at golf. 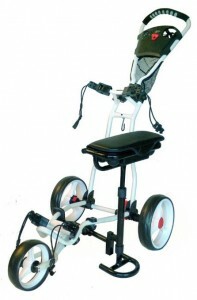 I’m not saying that buying a push cart will make you better at golf, but it sure can’t hurt your game or your health. I’m guessing most people reading this could walk a bit more and a push cart will help. A golf course typically averages around 6500 yards. There 1720 yards per mile which works out to being roughly 4 miles of straight line walking. Let’s face it, you aren’t walking in a straight line while you golf. We’ve tracked our walking on the course using a fitbit and find walking a round typically works out to be 8 or 9 miles. Nine miles sounds crazy, but it really isn’t bad when you’re having fun and it means you can get some exercise while you’re enjoying a round of golf. Below we’ve compiled a list of the best push carts on the market today. Clicgear has quickly become one of the leading names in the golf cart business, thanks in large part to the way these carts can fold up into a small package. 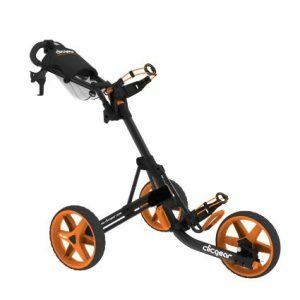 Despite offering you a full-size golf cart when unfolded and in use, the Clicgear is actually only 13’’ by 15’’ by 24’’ when it is folded up and put away. This is great news for both travel and storage, as you aren’t going to have to dedicate a significant portion of the garage to this item. Once you get the hang of folding and unfolding the cart, you will be able to do so in just a matter of moments. Turning to performance, you will likely find that this cart meets or exceeds your expectations in just about every way. The aluminum tubing that has been used in the construction of the cart is durable sturdy, and the airless tires will allow you to play round after round without ever having to look for a pump or an air compressor. Your bag is strapped securely into place while you play, and there are some nice accessories included such as a cup holder and mesh bag storage area. Also, there is a front wheel lock built-in to the design, so you can keep the cart in place even on those tough side hill lies. It is easy to see why this cart has become a favorite of many players, and it is certainly deserving of your consideration when you set out to buy a push cart of your own. While most of the push carts on the market today feature a three-wheel design, this option from CaddyTek goes in a different direction by adding a fourth wheel. The stability of this cart is hard to beat thanks to its four-wheel design, and it also has most of the other features that are found on competing carts. With airless wheels, a strap to hold your bag in place and a mesh net to hold other accessories, you should have everything you need on this cart for a great day on the links. Despite the addition of an extra wheel, this cart is actually able to fold up to dimensions that are very similar to those from the Clicgear cart above. You will find an umbrella holder that can come in handy when the rain comes in halfway through your round, and there is a scorecard holder as well. Additionally, this is one of the least expensive push carts you will find on the market, so you have the opportunity to get plenty of features and performance for a modest price. When you arrive at the course, you don’t want to waste any time before you head to the first tee. With that in mind, the CaddyTek EZ-Fold 3 Wheel Golf Push Cart is a great option thanks to its One-Click system for opening and folding the cart. The cart folds up into a compact shape when it is not in use, but it can be opened back up with just the push of one button and the completion of a couple steps. It is never fun to be wrestling with your push cart in the parking lot while your friends are walking to the tee, so pick up this cart and be ready to play at a moment’s notice. One of the nice touches that is present on this bag which you might not find on others is a cooler bag which has been designed to fit nicely on the cart. It is always a good idea to have a cool beverage available while you stroll the fairways – especially when playing under the hot sun. The cooler bag on this cart is the perfect way to improve your hydration from round to round. 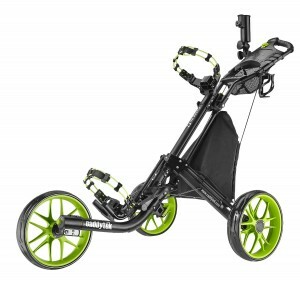 If you are looking for an all-around push cart with all of the features you need to enjoy yourself on course, the CaddyTek EZ-Fold should be on your list. Weighs less than 18.5 lbs. Most golf courses have benches available for players to use while waiting – often, those benches are placed near the tee of each hole. However, what if you have to wait when you aren’t on the tee, such as while you are standing in the fairway waiting for the green to clear? When that happens, you will be happy you have purchased the Spider 3 Wheel Golf Cart with Seat. As the name would indicate, this is a push cart that comes complete with a seat mounted to the side of your bag. No longer will you need to look for a bench when you wish to sit down for a moment – you will always have a seat available with the rest of your gear. Along with the seat, the Spider also includes the other features you will be looking for in a push cart such as a stable 3-wheel design, a brake, compact storage size, drink holder, and more. You won’t have to sacrifice any features when compared to other push carts in order to add a seat, so many golfers will view this product as a win-win situation. There is no doubt that owning a push cart can make walking the course far more enjoyable. If you would like to walk the course regularly and you want to avoid putting the strain of carrying your clubs on your shoulders, consider picking up a push cart from our list of quality options above.